When I work with teachers who are hoping to boost their children’s exposure to informational text, sometimes they are concerned about the vocabulary in informational text being too challenging for their children. They are wise to anticipate that some children might not be familiar with some of the words used in some texts. At the same time, I encourage teachers to keep in mind that for some children it’s actually the vocabulary that draws them to informational text. Use good quality informational text that doesn’t shy away from rich vocabulary. Embrace the new words yourself. Create a classroom climate that loves words by talking about new words, praising children who ask “what does that mean” and excitedly sharing new words and their meanings with children. It’s also great to model not knowing a meaning and having to look it up—just be sure you do! Look for ways for create categories so children start to sort the information. Try using visual prompts so you use the vocabulary more yourself. Try making a list of the words that you want to be sure children are picking up. If you’re talking about different kinds of trees, for example, your list might include conifer, deciduous, cone, flower, seed, leaf, trunk, and photosynthesis. Print out a sheet with those words on it, in a large enough font to see across the area, and post them around the room. When you see the words, you’re more likely to use them yourself. Additionally, the text adds to your print rich environment and children may start to interact with text as well. Use graphic organizers to help children make connections and categories. This photo demonstrates a Venn diagram activity done to sort similarities and differences between sharks and whales after a unit on "Under the Sea" that allowed children to learn about a variety of sea animals. Not only does this strategy give children a chance to make sense of the vocabulary, but becoming familiar with graphic organizers in the early years can assist them in using them in later grades and subject areas such as math and social studies. Vocabulary games can be a blast. Like using a Venn diagram, just sorting words into categories can be fun. Have a list of words from two different units you might have studied such as "Under the Sea" and "Trees." Give each child a word. Then have two pictures on the board, one of the sea and one of the forest. The children need to sort themselves into the groups based on their words. Where does “fish” go? Where does “conifer” go? If the child isn’t sure, he or she can ask a friend. Everyone’s vocabulary knowledge is strengthened by interacting around these words. To make it silly, put the words face down on the floor and have everyone pick one. How fast can they sort themselves? This is a great outside or gym game as well! You can also try games like twenty questions or I-Spy to have children guess your vocabulary words. Word learning has gotten a bad rap but the learning of the words and the concepts that go with them can be easily incorporated into a play-based environment with just a little thought. Most importantly, by giving children access to a rich vocabulary, we give them the keys to much better comprehension, now and in years to come. The more words they know, the fewer times they’ll encounter words they don’t know…and when they do encounter an unknown word, they’ll have the confidence and strategies to make it their own. 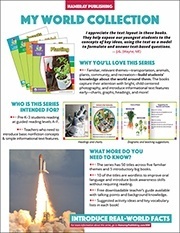 For more information on the My World series by this author, you can click here to visit the series page on our website or click the image below to download an information sheet.